My home office/studio is far from being finished so I’ve set up a temporary office in the dining area of my kitchen. The table, Mingle table from Ferm Living ,will actually be my permanent table for the office. It’s working brilliantly in the kitchen which is actually making the decision for the new dining table to even harder! If you saw my instagram post about my New Norm ceramics (where I waited 3 weeks until I found THE plates) then you’d know that I am trying to avoid buying any throw away/temporary furniture or accessories. It’s so tempting to buy something “for now” then aim to replace it within a year or two and just throw it away…… Needless to say, I have great concerns about this. If many of us think like this and don’t dispose of our temporary products responsibly (rehoming is the only responsible thing to do unless it’s broken then you must recycle) then it’s an obvious environmental issue. I’ll try to stop sounding like an eco warrior but this is a brief explanation of why I’m tying to avoid buying unnecessary items (I could go on and on about this). What I have in my temporary space will be used throughout the house and once my studio is complete. Take a look….. I discovered Notem recently. They are a new Danish stationary brand and their designs are pretty amazing. Well worth checking out. 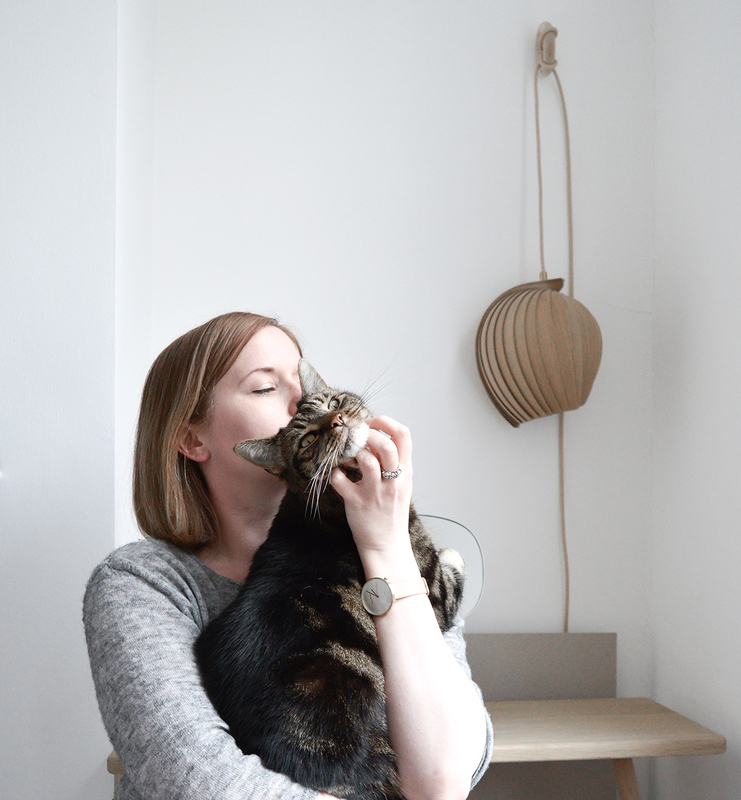 The new items here are my Mingle table and Plant box by Ferm living. Everything else was brought from London. This incredible mug by Olivia Fiddes in collaboration with Faye Toogood was my goodbye London gift to myself. I love it. Sticks shelving by Menu, for the dining area. A great investment and can be used elsewhere if I choose to move them. Hansel stays but may end up in the office. I’ll be re-styling this minimalist shelving weekly, for the fun of it. Plus it’s good to move your cherished pieces around the house, keeping the home interesting. There we go. This is my temporary live/work/eat space. It will be changing lots over the next few months and I’m looking forward to seeing it develop. If you like the table so much and it works for dining as well as for the office, why not indulge in a second one for your other space? . I love every piece Hannah, you have the best taste in furniture! I think I might need those shelves.